I know I’ve said it once, but I’ll say it again. Dating a farmer is something you really have to adjust to. It is not an 8 a.m. to 5 p.m. job and your date night or dinner conversations revolve a little too much around the latest and greatest equipment (that he wants but can’t afford) or what went wrong (or right) that day. But then there’s harvest season . . . This brings us to a whole new level. Being 26, many couples my age are spending their fall weekends either at apple orchards, haunted hayrides, fall festivals or zombie pub crawls, drinking pumpkin spice lattes or some sort of craft pumpkin beer. Not us. I’ll be honest – we’re lucky if we get around to buying a pumpkin from the local grocery store, and even luckier if it gets carved together. Dating a farmer is one thing, but dating a farmer during harvest is another. Here’s a few tips and tricks to surviving harvest while dating a farmer. As we are in the midst of harvesting, I thought I would write a few, fun random thoughts about harvest. Some things about harvest most non-ag people don’t know. 1. 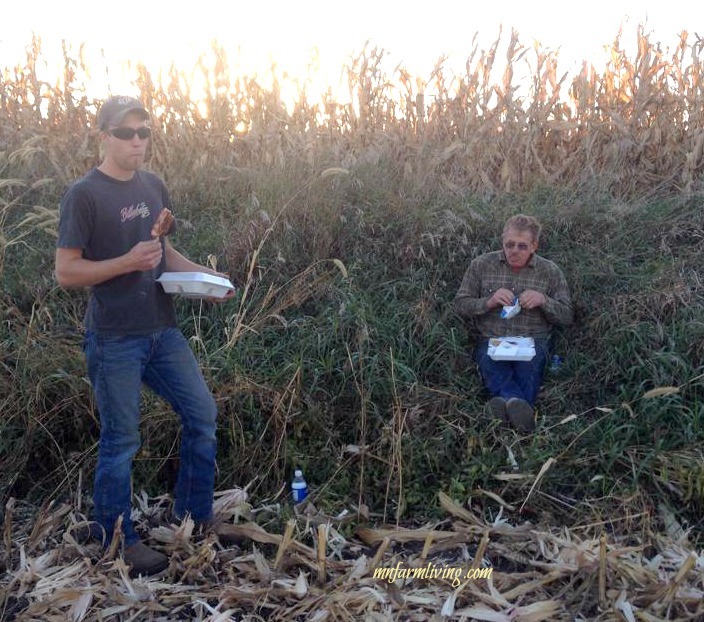 Lunches are eaten in the field. Thank goodness for autoSteer in tractors and combines. Autosteer is a mechanism that automatically steers the combine/tractor. I can literally eat, with both hands, while the combine/tractor continues to operate. And, believe me, I have eaten many meals this way! Multi-tasking at it’s finest. And if you have lunch delivered to you, it’s eaten right in the field. So you might be sitting on a pickup tailgate or somewhere semi-soft on the ground. Farmers really do love harvest meals – just a nice little pick-me-up and one less meal to prepare. Trust me, it’s the little things. 2. The smells, sights and sounds of harvest. 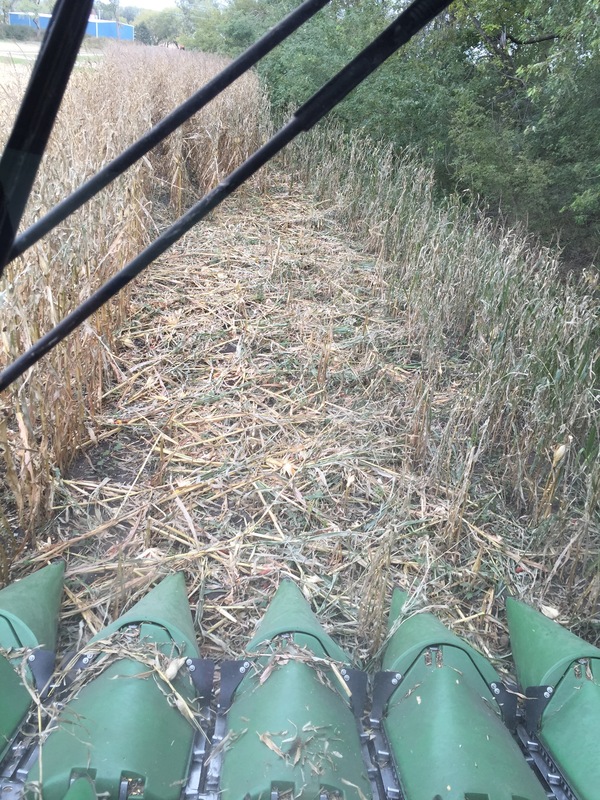 Nothing compares than smelling corn as it is harvested, watching the corn augered into the grain cart or truck, running through the corn dryer or hearing the sounds of corn dropping into the corn bin. Yes, it’s the simple things we cherish. And it mirrors life–it’s the simple things that really are the big things in life. Another “sight of harvest” is evidence where we are feeding the wildlife–more specifically deer. 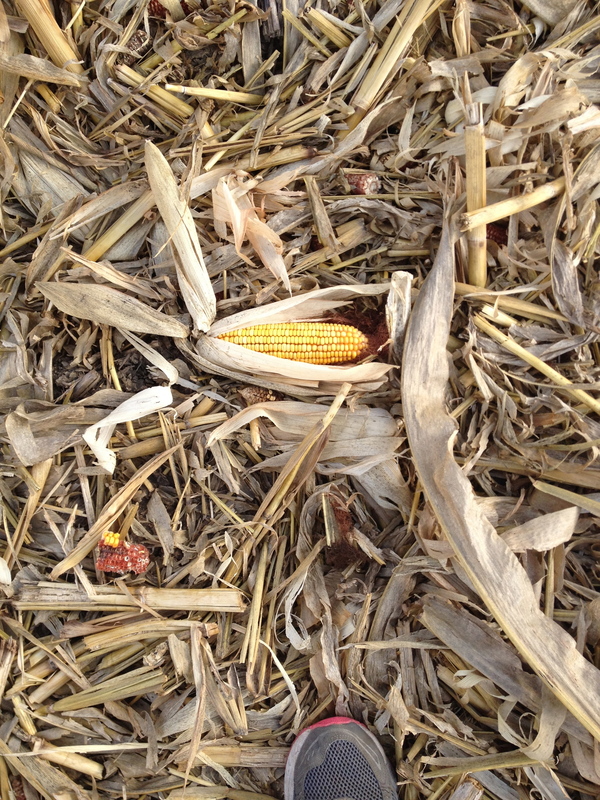 Here is a picture of what our cornfield looked like as we harvested corn. There was some kind of party going on here! It’s nearly nonexistent – you adapt to looking past the dust and clutter. Laundry during harvest? Just enough clean clothes to wear and sometimes we recycle clothes if they aren’t too dirty. And it may mean wearing mismatched socks because that’s all you have left. Grocery shopping? Minimal. Harvest season means early mornings and late nights. It’s just the reality of life in the fall. You will hear me say numerous times, “we’ll make it work.” We just adapt. Grandkids especially like this! 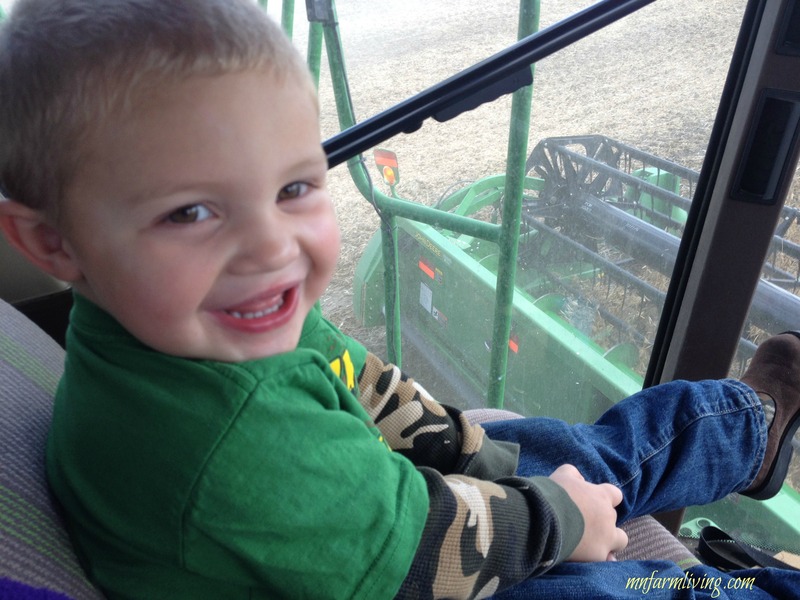 Many combines/tractors have buddy seats which can accommodate safe rides. And they love it and you can’t beat the smiles! 5. Field “dates” with your spouse. I don’t think I spend as much time during the day with my husband as I do at harvest. Ummm some days that is good . . . other days not so . . .
6. Dropped ears of corn on the ground. If you are the combine operator harvesting corn, it absolutely drives you crazy when the biggest ear of corn in the whole field hits the corn head or slides off the corn head and drops to the ground. I literally have dreams where I am holding onto the corn head trying to catch those wayward ears of corn. A little weird? Yep. Weird things happen when you spend hours and hours in a combine. And the bright side? It’s winter food for the wildlife. In my combine cab. Why a pillow? No, not for me . . . although at times I sure could use it. 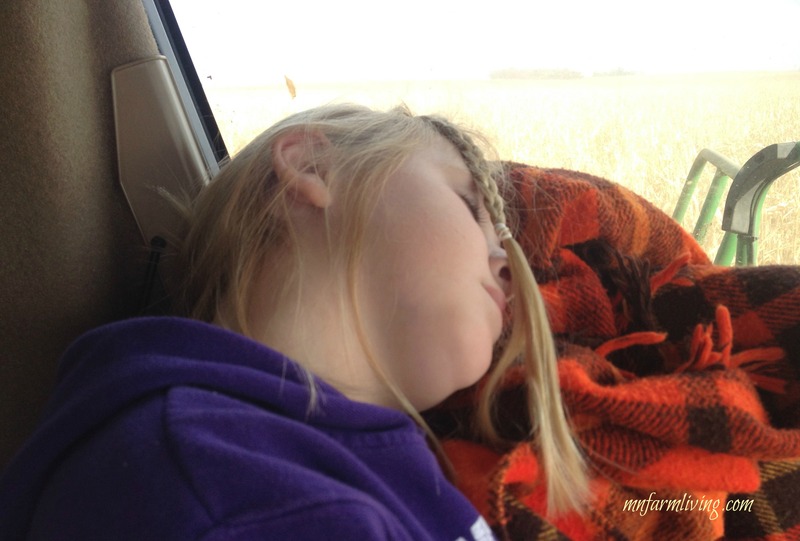 If I have a grandchild ride with me, it never fails the sound of the combine and the monotonous view and sound of constant corn/soybeans flowing into the head of the combine lulls them to sleep. Never fails. No matter how hard they try. 8. You become “snarkier” as the harvest season progresses. You can’t help it. Your sense of humor ends up being sarcastic remarks and you need an attitude adjustment. And when you can admit it to yourself, you really know you need it. 9. The whole family is involved. Harvesting is truly a family affair in the fall. From brother-in-laws to son-in-laws, to daughters and sons, to mother-in-laws. We can’t do all the work without them. And we appreciate all of them. Immensely. 10. And when you are done with your own harvest and pending weather forecasts are unfavorable, you help neighbors and friends to finish. It’s just who farmers are and what we do. And you don’t wait to be asked. You just do it. And I wouldn’t trade this life for anything. Where Do Our Crops Go? In southern Minnesota, most farmers grow two types of crops – corn and soybeans. A few farmers do grow alfalfa, sweet corn and peas. With all the crops grown, where does go? Market access is THE most important factor in determining what crops we grow. Crops with no markets make absolutely no sense to grow. And, in Minnesota, we have an abundance of markets for soybeans and corn. In addition to the available markets, we raise pigs whose major diet component is corn and soybean meal, which is the main reason why we grow corn and soybeans. We are also able to utilize the hog manure and incorporate it back into the soil as a natural nutrient replacement. It is a great way to use a byproduct (previously thought of as a waste product). Not only do we feel manure is superior to commercial fertilizers, but the cost of manure is less also. We test both our soils and manure so we apply the right amount of nutrients. We don’t want to waste it by applying too much nor do we want to apply less than we need because this is next year’s plant food. As you can tell, manure is a highly prized commodity and an asset. I literally put the value of manure applied to our cropland on my balance sheet. We have multiple markets available. I can literally see two ethanol plants and one soybean processing plant from the front porch of my house. All three are within 10 miles of our house. We are fortunate with not only the markets available but also how close they are to where we live. Let’s start with soybeans. We plant about a quarter of our acres to soybeans. After they are harvested they are either stored in a grain bin or sold to Cenex Harvest States – a soybean processing plant. The plant is about five miles away and we put them in a truck and deliver them to the plant. CHS processes the soybeans into soybean meal which is used for livestock feed. Soybean oil is also extracted from the soybean to make food and industrial products such as soy oil and plastics. The decision to store or sell at harvest is price dependent. We plant the remainder of our acres to corn. When we harvest the corn we usually need to remove the excess moisture from the corn. We accomplish this task by using a corn dryer. If the stored corn has too much moisture the corn will rot and spoil during storage. Rotten and spoiled corn has no value. Approximately one-third of the corn we harvest is used for pig feed. 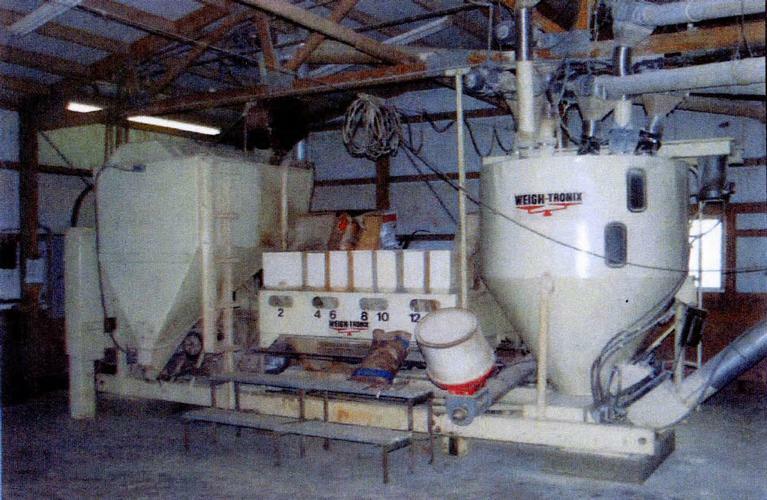 We have an on-farm feed processor manufactured by Weigh-Tronix. Our farm is a little unique in that we make our own hog feed. Many other hog farms have their feed made by a local coop. We like the idea of feeding our own corn because we know where the corn came from, and, oh, I used to work at Weigh-Tronix and I received an employee discount on it. Yes, that makes a difference! The other two-thirds of our corn crop is sold to Valero. Valero is an ethanol plant that is located about 6 miles from our farm. Valero produces ethanol and grain distillers. Grain distillers (or DDGs) is what is left over after the ethanol is extracted from the corn. Grains distillers are used in livestock feed. We sell to Valero because we really like the idea of a renewable fuel source and think it is important for our environment. And, typically, we receive a little extra revenue. If we are not able to sell to Valero we will sell to our local coop – Watonwan Farm Service. We really are fortunate to have good markets available and we don’t take them for granted. 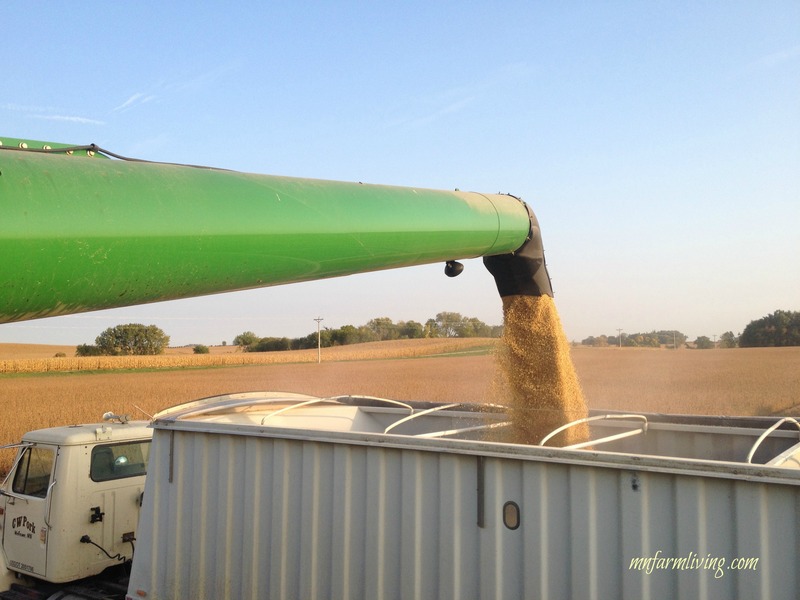 Check out the video showing soybeans harvested!